The public consultation on the EU Framework for National Roma Integration Strategies up to 2020 ran from 19 July 2017 to 25 October 2017. A key objective of the consultation was to collect views on the implementation of the EU Framework for National Roma Integration Strategies launched in 2011 and running until 2020. The consultation aimed in particular at gathering opinions on the achievements and challenges at European and national level during the first five years of implementation in the areas of education, employment, healthcare, housing and discrimination. The public consultation also asked about key priorities for the European and national level to which extra efforts should be attributed. In total 240 responses to the questionnaire were received of which 165 replies came from organisations while 75 were sent by individual citizens. Out of the 165 responding organisations, 106 answered on behalf of an NGO, think tank or an association (EU-level, national, regional and local non-governmental organisations (Roma and pro-Roma) active in EU countries and/or enlargement countries). 44 answered on behalf of a public administration (organisations representing national, local, regional and municipal authorities, and other public entities), and 15 answered on behalf of other organisation types (e.g. equality bodies, international organisations). Figure 1: Who replied to the consultation? In terms of knowledge on Roma policies, 79% of the respondents stated having knowledge regarding the local situation/living conditions of Roma, and 61% stated having knowledge of EU instruments for Roma inclusion in one or in several countries. Most of the respondents indicated having a direct connection to the issue of Roma inclusion, either through work (around two-thirds), out of personal interest (one third), or because they are personally affected by Roma inclusion (a quarter). 202 of the 240 respondents specified their ethnicity: 91 identified themselves as Roma and 111 as non-Roma. When comparing the situation today to that in 2011, a majority of the respondents indicated that there has been no major change regarding the situation of Roma in employment,healthcare,housing and discrimination. On the positive side, almost half of the respondents stated that the situation with regard to education has improved since 2011. 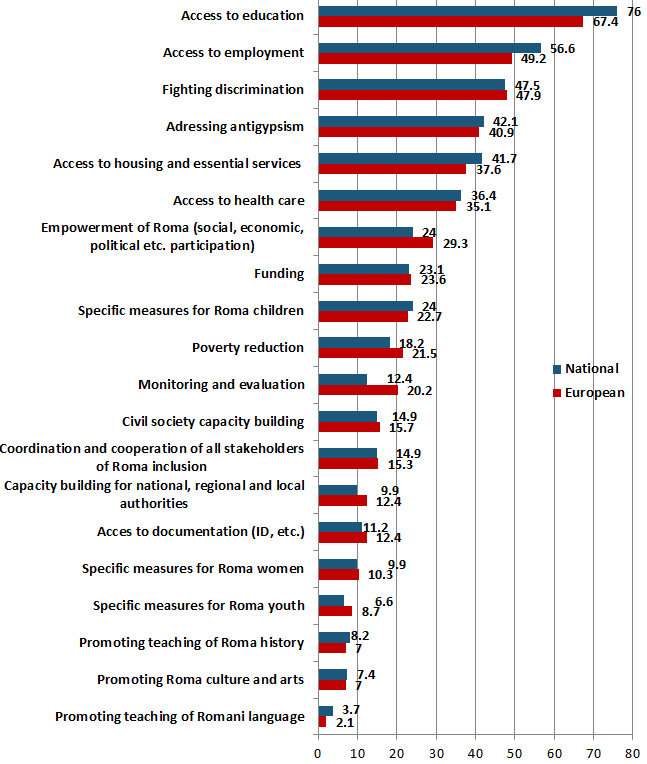 Figure 2: How do you see the direction of change in the situation of Roma when compared to 2011? The survey confirmed that Roma continue to be disadvantaged in society due to multiple causes, including in particular discrimination and negative attitudes of the majority society, limited political commitment and lack of Roma participation in the development of inclusion measures. Figure 3: To which extent do you consider the following phenomena as a relevant cause of Roma exclusion? An overwhelming majority of the respondents (between 86 and 95% depending on the thematic area) agreed that targeted public interventions are needed in the fields of discrimination, employment, education, housing and healthcare. For a majority of the respondents (almost 60%), the EU has a major role to play in supporting national, regional and local authorities because they cannot alone effectively improve the situation of Roma. Respondents consistently stated that both EU institutions and national authorities should work together to develop measures to improve Roma inclusion. They see a stronger role for the EU than for national authorities in the area of monitoring and enforcing European non-discrimination and anti-racism legislation and making access to funding conditional to developing and implementing ambitious Roma policies. National authorities are expected to play a bigger role in measures such as community building between Roma and non-Roma, non-discrimination and Roma inclusion training for public officials, making Roma history and culture part of school curricula, as well as providing policy guidance to authorities. A significant majority of the respondents agreed that the EU Framework brought about a series of achievements between 2011 and 2016 and that progress has been made in terms of policy development in the field of Roma inclusion at EU level. More than three-quarters of the respondents recognised that Roma inclusion was given more importance on the EU policy agenda and that more EU funding than before was available for projects fighting discrimination and promoting Roma inclusion. Figure 4: What do you think, have been the main achievements (between 2011 and 2016) at European level? 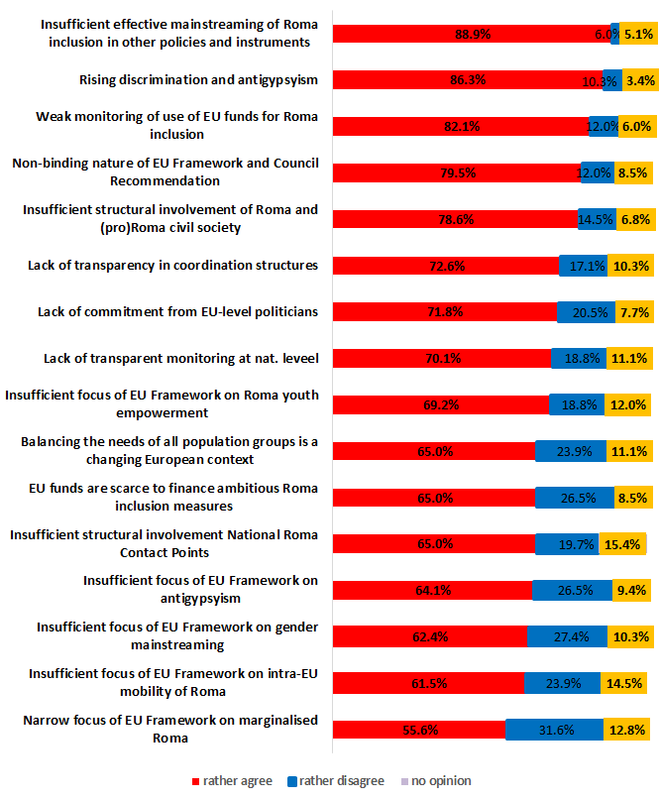 Key challenges identified by the respondents include the insufficient mainstreaming of Roma inclusion in other policies and instruments at both European and national level, rising discrimination and antigypyism especially at European level and insufficient funding allocated to Roma inclusion at the national level. Figure 5: What do you think have been the main challenges (between 2011 and 2016) at European level? With regard to suggested priorities at European and national level, respondents confirmed that successful Roma inclusion strategies need to be comprehensive. Access to education came out as a clear priority (67% at European and 76% at national level), but access to employment, health care and housing, fighting discrimination and addressing antigypsyism were also selected as a priority by at least one third of respondents at both European and national levels. Figure 6: Which fields should in your opinion become key priorities to which extra effort in form of e.g. human capacities, policy discussions, funds, etc. should be attributed at European and national level? The Commission is now carrying out an in-depth analysis of the replies to the public consultation. The full synopsis report, including also the results of targeted stakeholder consultations, will be published in due course. The results will feed into the design and implementation of EU policy in the area Roma policies. Contributions to the consultation are available as an attachment on this page and additional position papers sent in the framework of the consultation are available below. In total 28 position papers were received as part of the OPC. One organisation did not wish to have its contribution published. The majority of them were from NGOs, although UN Agencies (UNICEF, UN OHCHR), universities and the World Health Organisation also provided submissions. Some of the submissions were tailored responses to the OPC, while others were research or advocacy papers going back as far as 2010. Various organisations taking part in the survey and providing position papers (e.g. the European Roma Rights Centre, Equinet , the Inter Ethnic Initiative for Human Rights Foundation, the United Nations Human Rights Office ) highlighted that Roma communities continue to face multiple disadvantage in education, employment, health and access to housing. The contributions and responses received cannot be regarded as the official position of the Commission and its services and thus neither the responses nor this summary binds the Commission. The aim of the consultation is to collect stakeholders’ views on the achievements and challenges faced during the years of implementation of the EU Framework for National Roma Integration Strategies up to 2020, adopted in April 2011. More specifically, the aim is gathering views on European and national policy, legal and funding instruments that have been mobilised to fight discrimination and to promote the inclusion of Roma. Replies may be submitted in any EU official language. The contributions to this public consultation will be published online. When filling out the introductory questions on the respondent's background, you can choose to publish your contribution with your personal data or publish without personal data. As part of the European Transparency Initiative, the Commission asks organisations who wish to participate in public consultations to provide the Commission and the public with information about whom and what they represent, their objectives, funding and structures, by registering in the Transparency Register.